Well, this post is about rho zero (ρ°) cells. TLDR: It's even more obscure than usual. Most of this is very obvious but it's worth pointing out that ANT exchanges one ATP outwards with 4 negative charges for an ADP inwards which has 3 negative charges. The ADP needs an inorganic phosphate to reform ATP and this Pi carries one negative charge and enters the mitochondria via Slc25a3, facilitated by consuming one proton of the proton gradient. All is hunky dory with electrical balance, accepting some delta psi consumption. ρ° cells are man made constructs which have no mitochondrial DNA, usually deleted by exposure to ethidium bromide. They live by glycolysis and need supplementary pyruvate and uridine to survive. They have no electron transport chain proteins because they lack core components needed to form complexes I, III, IV and the F0 (membrane) component of their F0F1 ATP synthase. ATP which has been made in the cytoplasm enters the mitochondria via ANT running in reverse. The F1 component of the ATP synthase breaks down the ATP to ADP and Pi. ADP is exchanged outwards via the ANT antiporter and Pi is carried outwards in combination with a proton via the Slc25a3 symporter. This proton flux maintains the proton gradient across the inner mitochondria membrane, all of this process is being powered by glycolytic ATP synthesis. They cannot perform reverse electron transport through complex I, because there is no complex I. So no superoxide. Equally, there is none from complex III either. Clearly this has implications for what type of apoptosis they can perform and how they sense oxygen tension but more interestingly you can make ρ° versions of pancreatic beta cells. Back in the 1990s no one was thinking about RET as being essential to insulin secretion but they were pretty sure the process was based around mitochondria as well as needing glycolysis. In pancreatic beta cells glycolysis specifically inputs to the ETC at mtG3Pdh in large amounts, which will generate RET and the superoxide needed for insulin secretion. This occurs in other cells as part of insulin responsiveness, but not to the same degree as in the beta cells. Placing some functional mitochondria in to ρ° beta cells restores insulin secretion ability. The review suggests mtG3Pdh in beta cells acts as a sensor for cytoplasmic NADH levels. That's a nice idea. Just struck me as interesting. The EE in me keeps looking at the membrane potential and wondering if it could be tapped to power some electronics. I think someone put up a post on Facebook saying you can do this with plants but I never went looking to see what level of creditability it had! Hi Peter, Have you heard about the Insulin Index ? Work being done by Marty Kendell? What are your thoughts on its impact on LCHF diet? "I wonder if sometime in the future they will use these things as building blocks - Bio-batteries. When your cell phone dies you pour in a bit of lard..."
I suppose low-carbers would be averse to simply plugging in a new potato. There are quite a few people working on bacterial batteries. Bugs are used to enrich ores also and I think coal eating bacteria produce most of the methane that comes out of coal deposits. So, quite a lot of energy coming our way when you add in the bacterial contribution to herbivore digestion. Lovely couple of essays Peter, reading these I get the same feeling as when I listen to a Chopin scherzo or such-like. Virtuoso performance. Hmmm, did life in earth start in a discarded alien battery? I finally got round to reading this post of yours - glad I did! 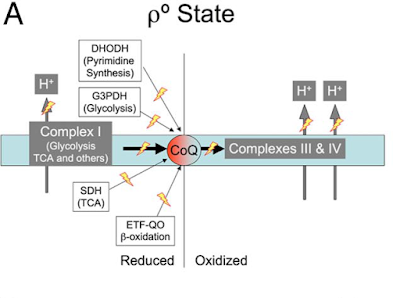 Oxidation and phosphorylation are uncoupled in substrate-level phosphorylation (SLP). SLP doesn't require external electron acceptors. p0 cells are lacking some of these external electron acceptors if I understand them correctly. So, p0 produce ATP in the cytoplasm via glycolysis - can they produce ATP via SLP too? Ok thanks for correcting the wrong idea I had about p0 requiring TCA activity to fuel SLP.